In her excellent debut novel, Emily Culliton reminds us that looks can be deceiving. The Palms live in a lovely old brownstone in affluent Brooklyn Heights. Nathan is a writer and stay-at-home-dad. Daughters Ginny and Jane attend a competitive private school, where Marion, their mother, works in fundraising. The family seems as normal as the next. But peek beyond the Palms’ mahogany molding and Pottery Barn couches, and you will notice the rubber-banded wads of cash—totaling $40,000—hidden in the basement. This stash is only a small portion of the $180,000 that Marion has embezzled from the school over the past few years. Much to Marion’s extreme displeasure, the IRS has just announced that it will be auditing the school, so she flees. With her illicit stockpile shoved inside a blue JanSport backpack, Marion abandons her family and—disquietingly for the reader—barely looks back. Whether or not the reader experiences sympathy for her and the ways she feels slighted by others—which we learn is the hot core of her embezzling—Marion’s shrewdness in running away is remarkable: “She prizes her own ability to coordinate, once wasted on PTA functions and her husband’s literary readings. Now she is coordinating her own getaway and she is and will continue to be magnificent.” The sense of vindication that Marion finds while on the lam is baffling, but it works: Culliton certainly did her research on the psychology and motivation of female embezzlers, because the plotline is believable—if distressing. 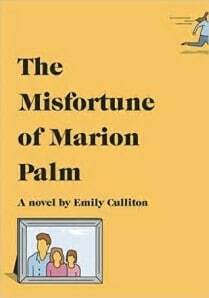 The Misfortune of Marion Palm is sad, yes, but it manages to be wickedly funny in a way that I adore, and this humor makes the story not just bearable but entertaining. Culliton has written the book in brief, snappy chapters (which, incidentally, all have perfect little names). These chapters keep the plot moving along quickly, and they are so exquisitely crafted that many could stand on their own as short stories. Currently, Culliton is working toward her PhD in fiction at the University of Denver. I’m not sure how she managed to wedge the writing of a (fantastic) novel in between her studies, but I suspect it’s because she’s as ridiculously smart and driven as Marion herself.